A new, broad line of vacuum suction cups and fittings for OEMs and distributors that are direct replacements for P-Style suction cups and fittings has been introduced by ANVER Corporation of Hudson, Massachusetts. 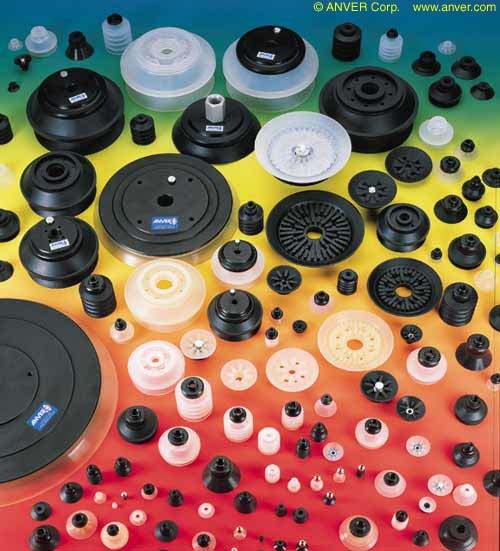 ANVER Vacuum Cups are offered in flat, single- and multi-bellows, oval, and deep suction cup styles that are directly interchangeable with all P-Style suction cups and fittings. Featuring neoprene, silicone, and other specialty rubbers, they are available in a wide range of sizes. Supplied as cups individually, or with compatible black anodized aluminum fittings, ANVER Vacuum Cups are offered in sizes from 4 mm thru 315 mm, depending upon style. These P-Stylecompatible cups and fittings can be ordered in any combination and quantity.